The Moon enters Cancer at 5:57 AM EDT, a comfortable place for the Moon. The keynotes today: emotionality, susceptibility, sensitivity, moodiness. At 9:18 AM EDT, a Moon/Pluto connection, followed by a Moon/Mars aspect, can make some defensive and full of “crankitude” as the day begins. Early Monday is probably not the best time to confront anyone, as “shields are up” and you won’t get much cooperation. Play catch up if you’re at work and stay out of the line of fire! The next Moon connections are with Mercury (1:45 PM EDT) and Venus (4:31 PM EDT), which means the middle of the day is less volatile and people are a bit more willing to communicate/cooperate in order to keep those social wheels spinning. The late afternoon highlights the Moon trine Neptune at 4:33 PM EDT, followed closely by Venus square Neptune at 4:47 PM. We’re emotionally open and willing to see and believe the best right now. However, our vision may be skewed as we ignore whatever doesn’t fit into our rose-colored scenario, particularly in the love and romance arena. It might be wise to take a second look. We may want to be “invisible” for a while, wishing to sit and watch the world float by. Mercury aspects Uranus at 7:54 PM EDT and then hits Pluto at 8:13 PM EDT, landing in the trigger zone of the tightening Uranus-Pluto square. Shocking or unsettling “game-changer” information may suddenly be revealed. Things may seem out of control; people scramble to batten down the hatches in the wake of the revelations. Smear campaigns and cover-ups may snap into operation. However, once the truth is out, it’s out—there’s no going back. At 8:17 PM EDT, the Moon trines Saturn, a stabilizing influence that may put us into a serious mood as we mull over the events of the day. Don’t obsess over things you cannot control; if you succumb, you’ll spend too much time in mental regurgitation mode this evening, which can lead to fitful sleep. The Keyword for the Sabian Symbol is: “PRESERVATION”. Today’s key Symbol concept is about value/s, both material and spiritual. The Sabian Symbol depicts a jewelry store, full of adornments made of gemstones, which are products of the earth. This Symbol relates to accomplishment or achievement (jewelry is often given as a gift on special occasions), an appreciation of beauty, and material success and wealth in all forms. There’s an element of romance here that ties into the Moon and Venus aspecting Neptune today—many people shop for engagement or wedding rings at the jewelry store, and walk in the door with high hopes for the future. It also brings in the idea of possessions and possessing, and on the down side can relate to extravagance, living beyond our means, or being covetous or overly focused on material things to the point of excess, extravagance or just plain tackiness. 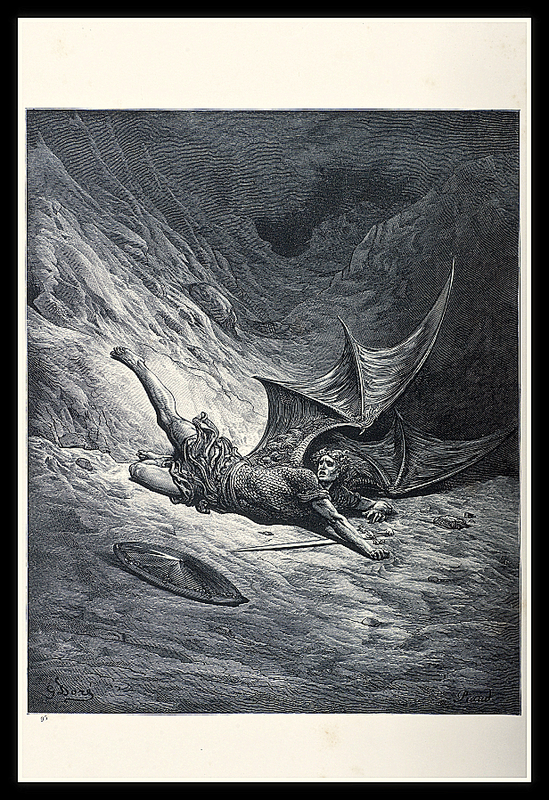 The Kozminsky Symbol, St. Michael fighting the dragon, is an archetype, the concept of Good vs. Evil. Kozminsky says that St. Michael is “the life, solar energy, conqueror of decay” and the Dragon is “lust, corruption, and the cold moistures of the earth.” The black rain is the evil where corruption lurks. This Symbol seems to convey some of the spirit of a Sun/Saturn opposition in its most challenging mode, as the soul force fights to remain in the light and vanquish negative and destructive patterns that can drag us into despair. Today’s Moon/Saturn trine tells us it’s time to step up and rise to the challenge in order to protect others from falling prey to the darkness. There is a protective aura to this image, it’s talismanic in nature. This combination can mean sudden, inexorable change. Nothing is the same again. It’s St. Michael holding his sword up high after killing the dragon. It involves confronting the abyss and walking away with a new understanding. There’s no turning back. This combination illustrates the exact moment when things shift forever. We come to a new understanding through endings, traumatic events or extreme changes. We’re asked to completely redefine ourselves in the wake loss. We’re beginning a new cycle of change, but it requires must learn to think in a different way and cut away all illusions, which can be a painful process. Our eyes are opened wide. A new reincarnatory cycle begins as we enter the next phase. The Ace of Swords is an Air card, so ask yourself—are you still holding on to the ghosts of the past, wisps of memory, a fog of despair—are you haunted? It’s time to rend the veil.